Transitions are difficult for small children. Whether it’s getting Johnny to put down his crayon because it’s time for lunch or coordinating a group to put away the toys, helping little ones to adjust from one activity to another is a constant challenge for the grownups who care for them, in homes, schools, and day care centers. This book is a practical guide to making transitions flow smoothly between children’s activities. The authors, all early childhood education experts from Wisconsin, use the concept of the “emergent curriculum,” or curriculum that emerges from a child’s life experience and interests. 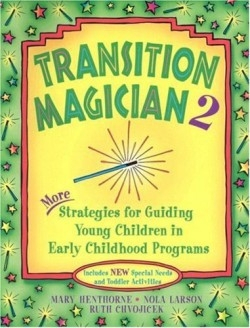 Their first book (Transition Magician) identified eight important kinds of transitions in a child’s daily schedule, from gathering for a group activity to stretching to staying occupied while waiting. The transition activities are centered around a theme or topic, which the adults would choose after observing the children’s abilities and interests. The second book expands by including specific activities geared towards toddlers and children with disabilities. The authors use a “Magician’s Map” to plan transitions. The theme is placed at the center; radiating out are the eight types of transitions; extending from them are specific examples to make each transition from theme happen. One suggested theme is “Harmonious Hands.” In one activity, the children make a handprint; the adult writes their name on it and uses it as an attendance marker at the beginning of a day or group time. The prints can be used for stretching, to help manage waiting, or to say good-bye. Another strategy is to have a Handy Glove Beanbag for each child to use in a movement activity—place it on different parts of their bodies, move and shake it to music, manipulate it following adult direction. The beanbags can also be used to help children gather and settle, in passing games, and as sensory props for disabled children. The book gives clear instructions, encouraging illustrations, and materials lists. An excellent set of appendices offers extensive references and resources, patterns and templates, forms for self-evaluation and reflection, and cross-referencing of the activities.